Today we met with Patrick Hubble from Hubble Designs to discuss the ideas and inspiration behind our newest display home ‘The Belvoir’. Patrick and his team at Hubble Designs had a very hands-on approach, working with our team to create a home that was not only a beautiful house, but a space that represents bringing memorable lifestyles to reality. What was the inspiration behind the Belvoir? The Belvoir is inspired by country living, and in particular the shape of the affectionate barn houses which are common in the country side. Designed for expansive blocks either close to the city or within the country, a home deserves to be large, expansive, lofty, with a good sense of openness to the outside. Combined with plenty of natural light, ventilation and a front and rear verandah, the home is visually appealing from all angles. With a variety of living spaces and an openness to the exterior, this is the perfect home for a growing family, or for parents with growing children. The spaces are ready for separate living arrangements with a separate rumpus available for use as a second living area. The geometry of the house naturally creates two courtyards - which could be used as ideal play-spaces, utility areas or entertainment purposes. The home allows for parents to be at the front of the home with essential ownership of their own living spaces, with a separate living space dedicated for children, and a joint living / dining space for the whole family to come together. The home features a very 'open' feel, how did you achieve this and what are the benefits of doing so? We achieved an open plan living-dining-kitchen area through arranging the central living areas together in addition to having both outdoor areas on either side of the living spaces. This provides for a visual spatial extension to enable indoor-outdoor living lifestyle. Even though the open plan spaces are centrally located, the rumpus and front living areas provide separate areas for both kids and parents respectively, providing a balanced combination of communal living and privacy. The furniture and colour scheme of the Belvoir is ultra-modern, yet simple and classical. What did you do to achieve this perfect mix? Through the design of a warm yet subdued background palette in the central living spaces, this complements the selection of furniture which has similarly textured and complementing colours to the background. Special pieces were then selected to highlight each space, including cutting edge bathrooms and modern external finishes to achieve a mixture of homely and contemporary appearances. This home really accentuates the outdoor living spaces, almost creating a grande indoor-outdoor feel. Was this done specific to the beautiful Kalamunda location, or could it be replicated anywhere? The indoor-outdoor living concept is a contemporary idea, and it has every reason to be popular, as it achieves a much more expansive space without the need of extra interior living spaces. It is also very well suited to Western Australian lifestyle of entertaining guests outdoors. 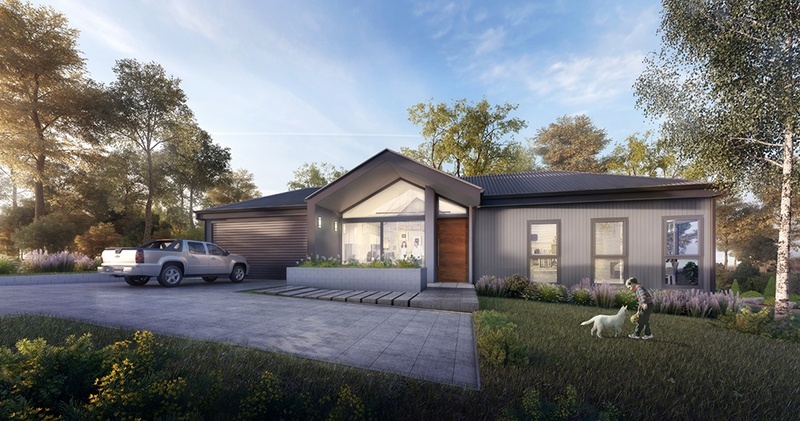 The house will sit well in any location, from the beautiful environment of Kalamunda to the countryside, or even to areas within the city, and it is quite adaptable. If you would like to check out Hubble Designs head over to their website www.hubble.com.au or call and speak to one of their experienced team on 08 9242 3167. For more information on the Belvoir click here!